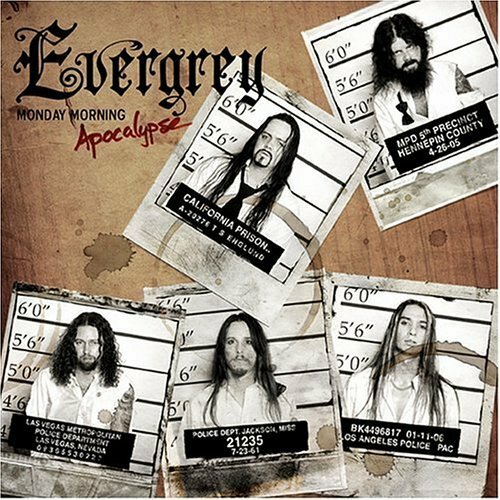 With their sixth studio album �Monday Morning Apocalypse�, leading Swedish metal band Evergrey proves to be more direct and more effective than ever before. The new material was produced by Sanken Sandquist and Stefan Glaumann (Rammstein, Def Leppard, Bon Jovi) and sounds incredibly contemporary. �This record shows what we are capable of doing� summarises vocalist Tom S. Eglund. The philosophy of �less is more� certainly does not always apply. Particularly in the art world, where lavish decoration can sometimes actually be the main focus of a piece of work. This is not however the case for Evergrey, where this time the tightening of the songs has become a true asset. �Our new songs are much shorter and so prove to be more effective� says vocalist Tom S. Englund about the band�s new album. He adds, �Especially on stage the �Apocalypse� material may even work better than our other songs, thanks to its more direct thrust�. Evergrey�s music combines melody and sheer power with a capable instinct for writing catchy hooks. The band shines brightest when guitarist and main songwriter Henrik Danhage is firing off heavy riffs and fast licks from his guitar, while drummer Jonas Ekdahl and bassist Michael Hakansson lay down the main groove, keyboardist Rikard Zander fills out the band�s sound with atmosphere and Tom Englund steers the songs with his powerful vocals. The term metal is sometimes too specific a categorisation for Evergrey. Various aspects of this genre can be found in the band�s material but with much more to create a homogeneous unified whole and it is this factor that has brought the band to the attention of fans and critics around the world. �Monday Morning Apocalypse� adds further strength to the undisputed power of the band. The production is state of the art and dynamic even down to the smallest detail. This is due to the production team of Sanken Sandquist and Stefan Glaumann who among others have already worked with Rammstein, Bon Jovi and Def Leppard. For the first time in their career Evergrey decided to let someone else take over the production responsibilities and it proved to be an overall positive experience. �It was really relaxing to know that we just had to write the songs and leave everything else to such a competent team� explains Englund. �Sanken produced the album and Stefan did the mix afterwards. During this process our ideas and suggestions were always in demand but apart from that we could lean back and work fairly relaxed�. This successful division of labour can be heard when listening to �Monday Morning Apocalypse�. With the gripping title track and the follow-up number �Unspeakable�, the track �Still In The Water�, a song made for live performance and the atmospherically dense �Lost�, Evergrey have forged a metal masterpiece for all eternity. It�s a mark of the slight change of direction that only �Still In The Water� passes the five minute mark. �Our goal so far has been to improve ourselves with each new record�, says Englund. �This has been our ambition this time as well. Stagnation means stepping back and that would be unacceptable for us�. With �Monday Morning Apocalypse� we can hopefully show more than ever before what this band is able to achieve�. So the apocalypse mentioned in the album�s title luckily only happens in the song lyrics when Englund tells us about the imponderability of every day life. �Always and everywhere there lurk strokes of fate with disaster, accidents, disease and death. This fact is reflected in the album�s title�, he explains. Perhaps his statement about the cover artwork fits in with this message. Although one should be careful to see the humour in it because it�s unlikely that the Swedish quintet will end up in the slammer anytime soon for their art. But who knows? �It�s possible that the cover predicts how things will go for us after the next tour�, grins Englund, and with a twinkle of the eye suggest the possibility of �a criminal tour through America�. However, Europe needn�t be deprived so assuming everything goes according to plan the �Monday Morning Apocalypse� will have its premiere in Germany.